Rarely have two books landed on our kitchen table at once that have been so different, yet so similar! 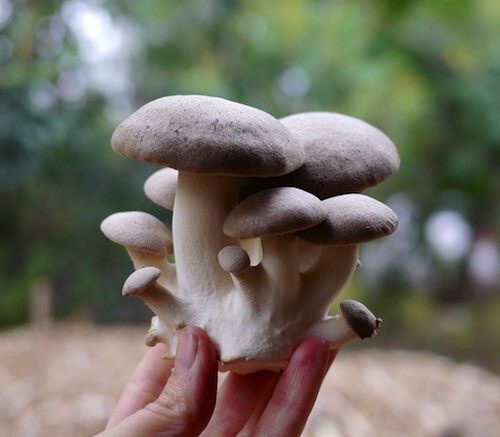 The Art of Frugal Hedonism + Grown and Gathered encompass deep urban frugalism (for hedonists) to dreamy-yet-muddy farm life+kitchen. With pictures. 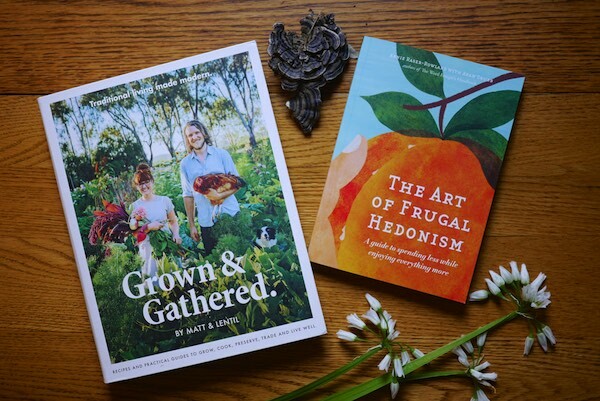 In a current climate where lots of folks are wanting to downsize, downshift, simplify radically, barter + trade, go no waste, grow good food and reconsider where working for years 9-5 in an office actually gets them in terms of health and happiness, both these books are both an antidote and an inspiration of sorts. 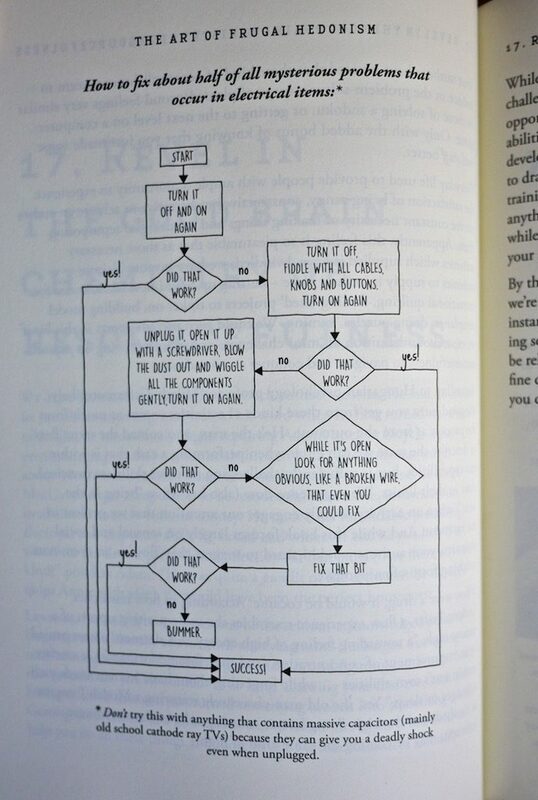 With buckets of good ideas to go around. Two very different reads, with lots of similarities, and differences. But centrally along the same themes: live simply, consume less, consume ethically, and make sure you have fun while you do it. 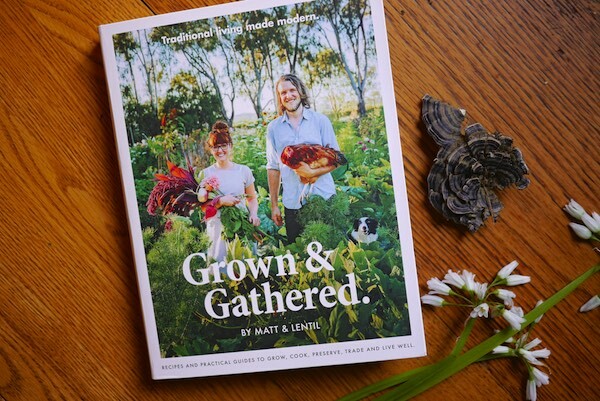 Grown & Gathered ‘s first book is one big labour of love – it feels like a big, convivial and tasty day at the farm that Matt + Lentil have packed everything they possibly can into. Except that it covers a whole year. And then some. 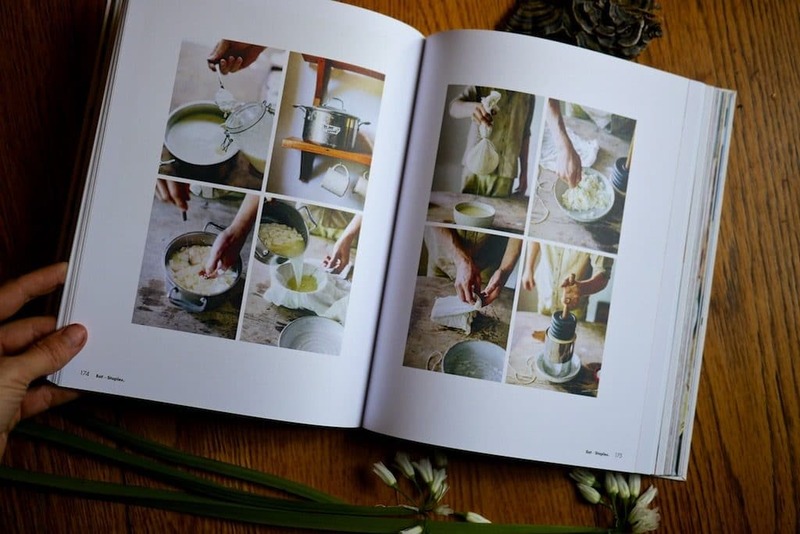 The Grown and Gathered book is a balance between homesteading skills (or small farm skills, depending which continent you’re on) and a huge amount of darn fine looking recipes that sing to the simple way of life. There’s a lot of love in this book. 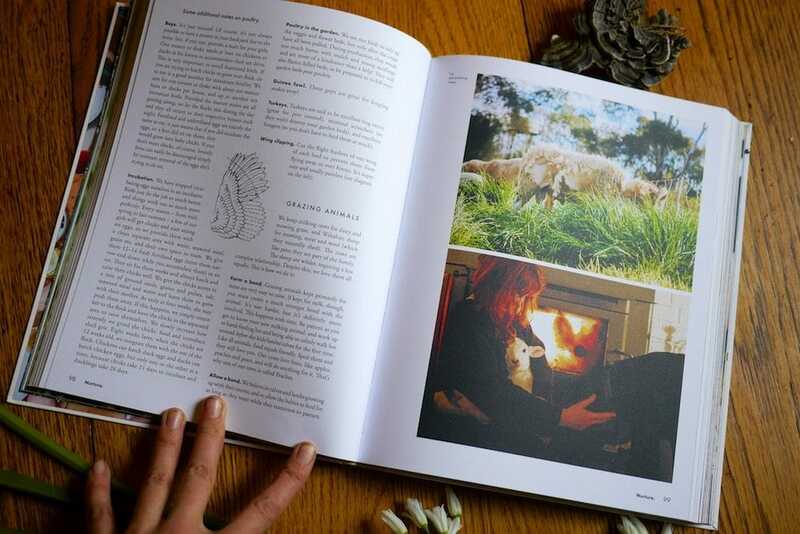 The first part of the book is basic skills + how-tos for gardening, keeping animals, making wine and so forth, as well as following a natural diet. There’s a lot of diet stuff in this book, actually. The how and the why of Matt + Lentil’s particular way of doing things. It’s big and it’s lush and it’s beautifully shot. Perhaps it’s because I read it while the world was dark and stormy and hailing outside, but my overwhelming impression of this book is sitting in a sunny spot while good slow-cooked food simmers, and friends arrive. 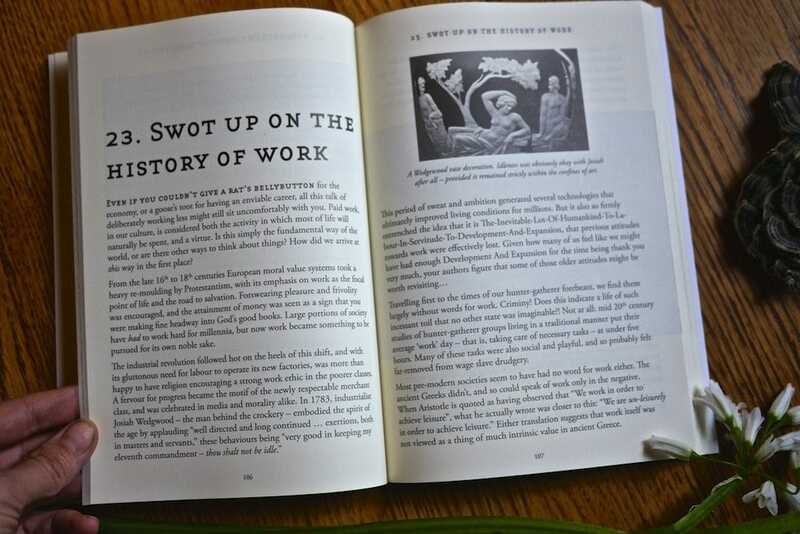 There’s notes on growing and also a whole chapter on bartering – how trading directly creates different relationships, and even community. 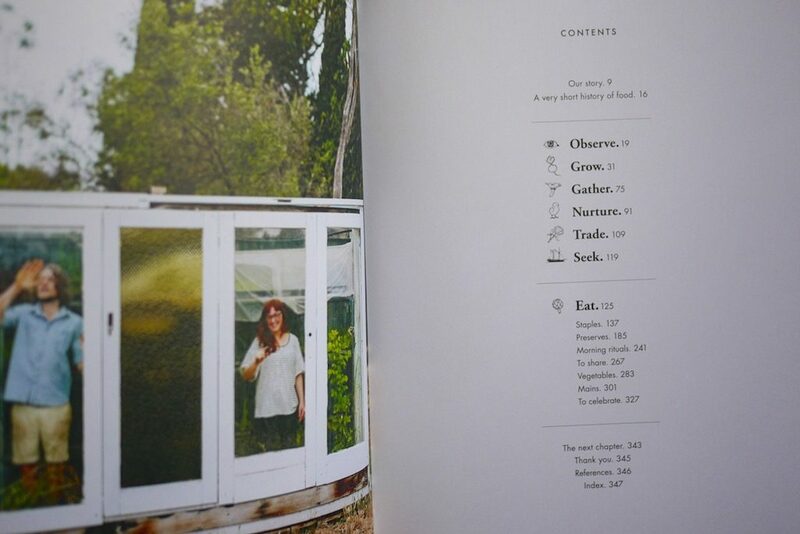 The second half of the book is recipes and food how-tos for wholefood, soured, soaked and ethically sourced everything. 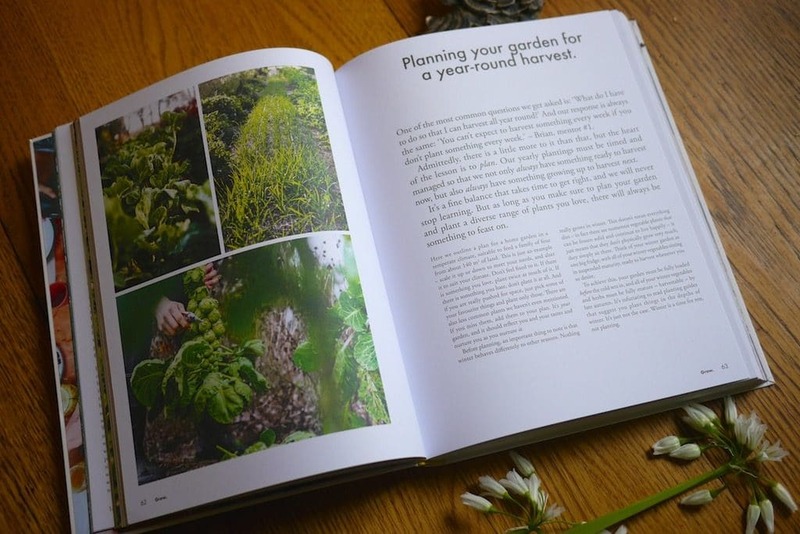 It’s great stuff – I can’t wait to try a whole heap of the recipes once our spring and summer crops come on. And a home-tinned tuna recipe for the oceanically-challenged (that’s us!) who don’t have easy access to coastal delights. Rocking. 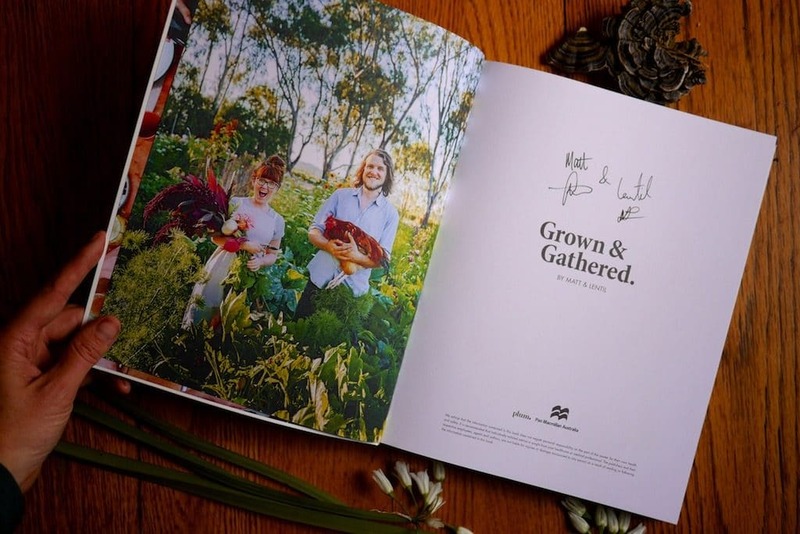 The thing I like most about this book is it’s conscious seasonality and commitment to sourcing local ingredients. 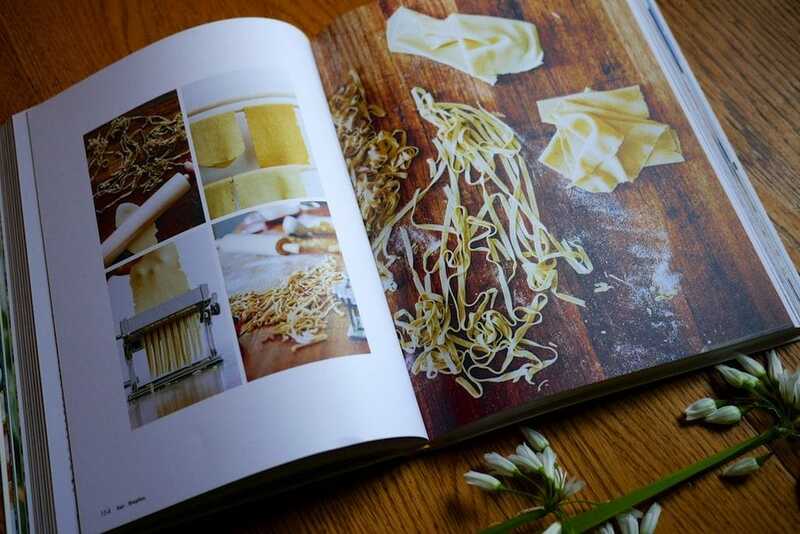 At a time when we’re almost being buried under an avalanche of funky looking cookbooks that say they care about local + seasonal food but seem to be situated in a utopian all-seasons-and-all-continents-at-once kitchen, this book makes you want to embrace what is nearby, and what is now. And then cook it with friends. 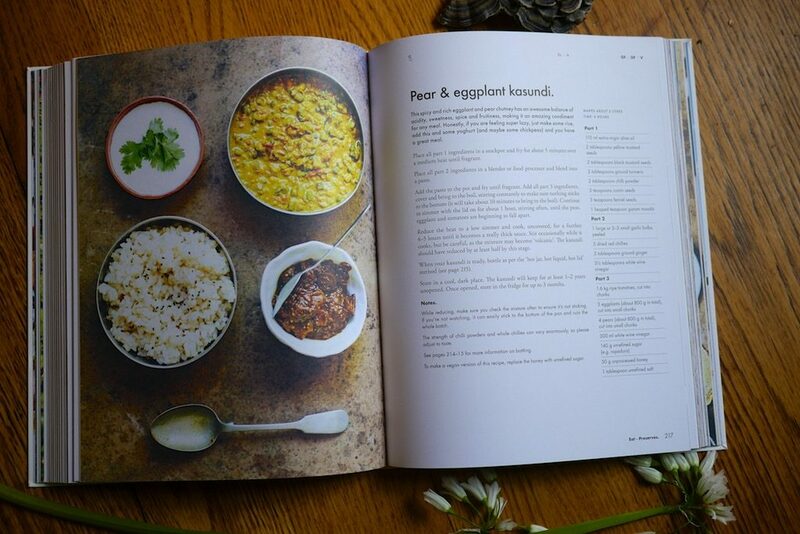 Grown and Gathered by Matt + Lentil Purbrick can be got from their website or Booktopia. 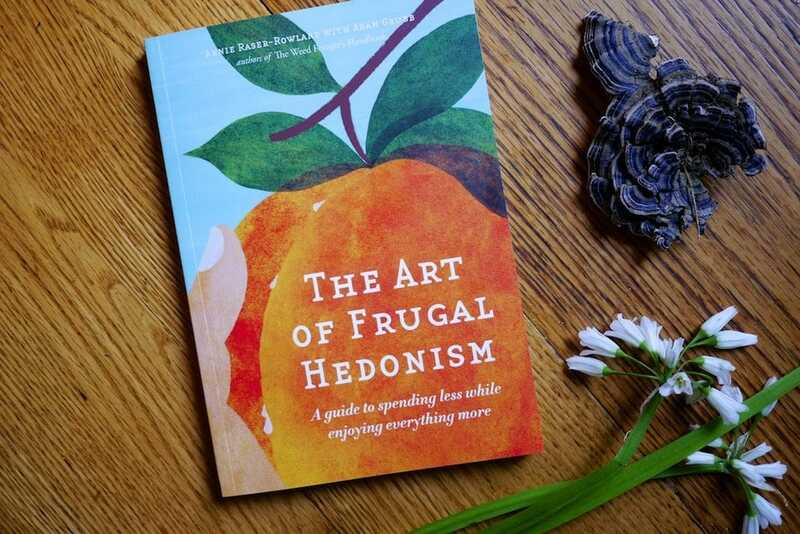 The Art of Frugal Hedonism is like having a small firecracker in your pocket for performing guerrilla actions on everyday life that just might upend everything and put it back together in a different, cheaper, and much more interesting way. The writing is buoyant and often verges on hilarious. And the advice is solid. Maybe not all solutions for living on less money that you think you can do just now (even though you so CAN!) 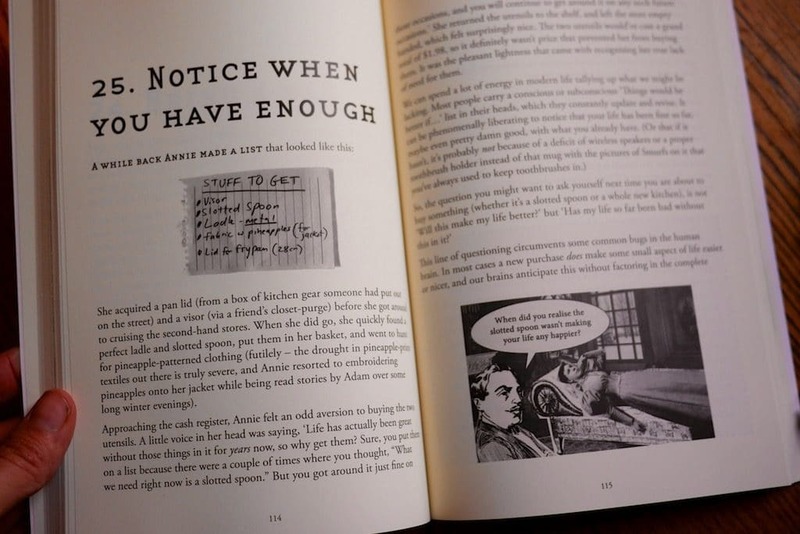 – but even if it all seems a bit much, you want to keep reading anyway. 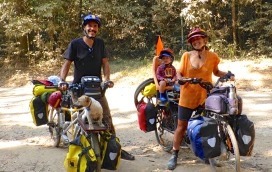 Both Annie and Adam have been doing urban frugalism rather radically for many years now, and it does certainly seem like they are having a good time. 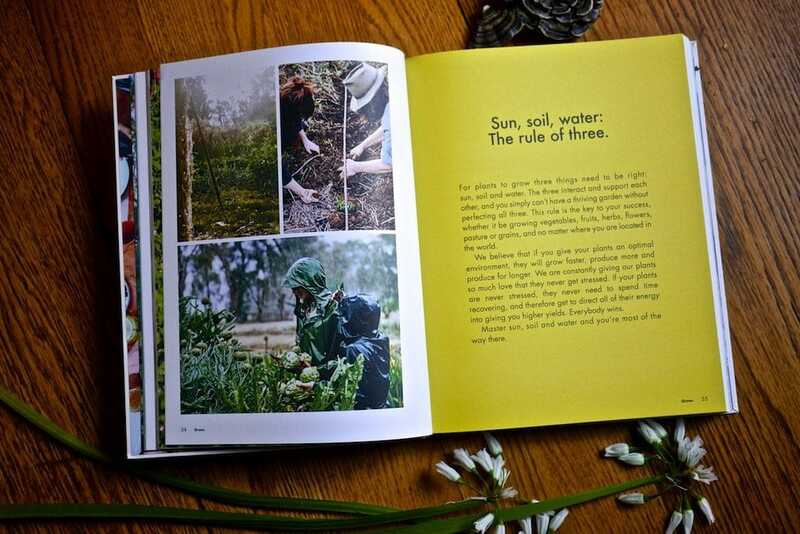 Their previous book, The Weed Foragers Handbook, was a well written, useful and straightforward weeds guide with plenty of twists and tips. And The Art of Frugal Hedonism builds strongly on that style, except this time all the stops are pulled out, the art of frugalism is evaluated in detail, and everything is on the table. One of the things I love most about this little book (and I should say, I love a lot about this book) is the hedonism aspect. 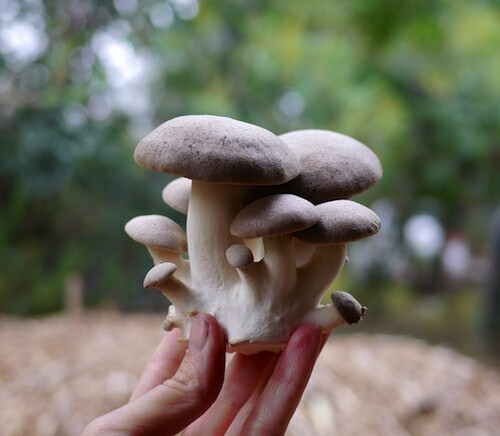 You’re probably familiar with the now fairly mainstream-ized ideas of no waste, low-cost living. There’s lots of jars, buying organic grains in bulk, up-cycled things made into cute tote bags and healthful breakfasts. There’s good teeth and clear skin and suspicious amounts of linen aprons. And large amounts of effort put into styling a light-filled, no-waste life. THIS BOOK IS NOT THOSE THINGS. 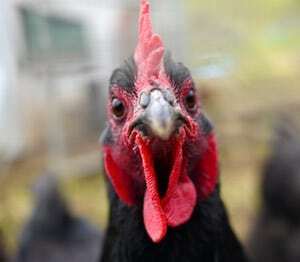 What came first, the frugality, or the egg that had a lot of things it was excited about doing? In your authors’ case, definitely the excited egg. There is no better incentive for being frugal than having passions you want to chase. Let’s break it down. 1. By consuming less, you have more money to spend on doing what you really want to do. 3. You can do a little bit of 1 and a little bit of 2 and have both the time and money to do the things you really want to do. Cake, and eating it. Back when Annie was a party-hard pop-punk, she cossetted secretive visions of herself travelling through Guatemala climbing volcano after volcano, or decorating a whole house with holographic wallpaper, and knew that she’d need cash to make those things happen when the urge took her by the jugular. And so she taught herself to make the clothes she wanted out of old clothes. She made a decision to religiously love cheese and tomato sandwiches every day for lunch, while everyone around her bought takeaway kebabs. Instead of going to the pub, she cajoled friends into drinking boxed wine in deckchairs on the sidewalk (illegal but lovely) and enticed strangers into sitting down to join in. She never made a budget, or even thought about money much, but instead forged a basic assumption that most things that people spend money on have an equally satisfying cheap or free alternative. And despite her minuscule income, the savings did slowly but surely pile up. Enough that she had the freedom to go spend a couple of mind-blowingly fantastic years climbing those volcanoes. But it’s not just talking about the fact that we all need more time, and less clothes (thought that’s part of it) to live a good and happy life. 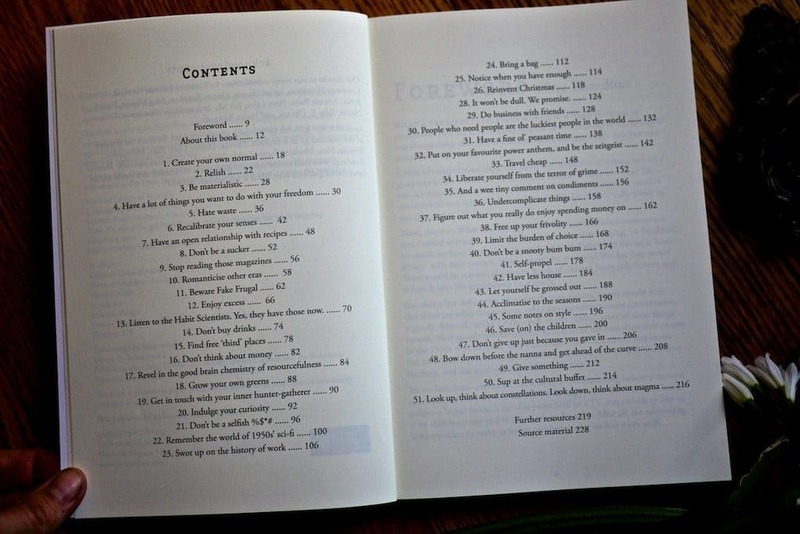 This book is also packed with quirky but solid advice for ways to re-use, barter, DIY, dumpster dive, swap and generally cut down on… all the everyday consumption you can think of. 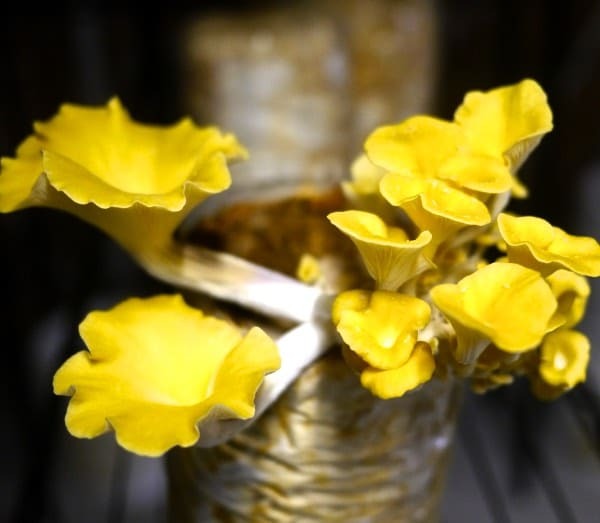 For the sake of limiting consumption on this one-and-only planet of ours, and also for the sake of living well, with a stronger community, and saving the money you do have, for things that actually matter. 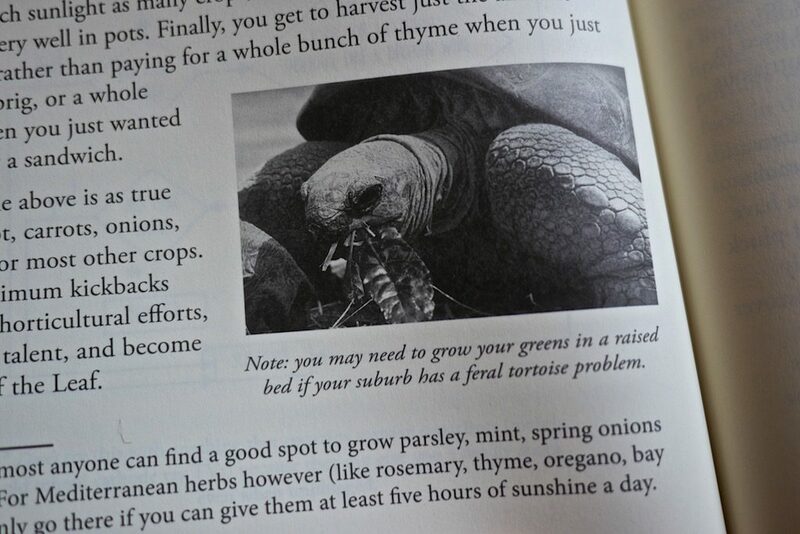 Also, the chapter on home-grown greens opens with a picture of a tortise munching on leaves, with a note that if you’re in a tortise-prone area, then you may need to consider a raised bed to grow some veggies. I rest my case. This book is a cult classic in waiting. 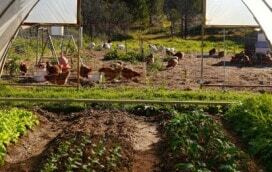 You can get The Art of Frugal Hedonism at the Permaculture Principles website. They ship worldwide.